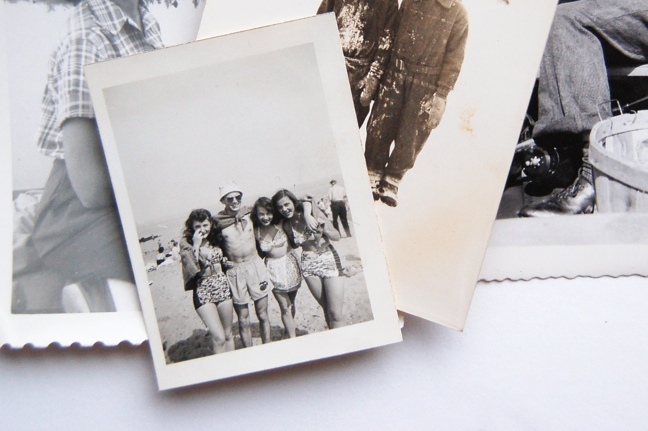 I’ve been having a lot of fun collecting and working with vintage photos for my snapshot hoop collection. 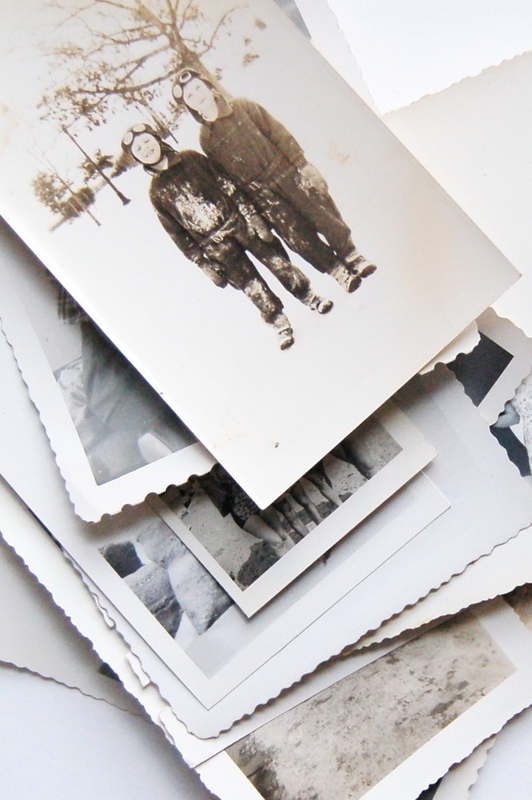 I have a pretty long history with using found imagery in my projects. In high school I mostly worked on collages both digitally and analog-ly. I have always loved cutting things up and putting them back together. Collage was a great medium for me because it involved cutting things up, yes, but also, it did not involve drawing which I absolutely, passionately hated. It’s not an exaggeration, I despised drawing. Maybe that surprises you because of my artistic background and my BFA but I assure you it is actually quite common for artistically inclined people to dislike drawing. Anyway, moving on…. When I first started collecting images for this line of vintage snapshot hoops, I was not sure exactly what type of image would work best so I went totally based on content of the image /visual aesthetics and looked only for black and white photos with high contrast or the potential for natural contrast adjustments through editing. I was lucky enough that in my first batch, I discovered that some worked better than others and why so I knew what to look for on my next shopping trip. It’s been so fun browsing these images of yesteryear. Even though most of the ones I see don’t suit my needs, I find myself looking through images for hours because they are just so awesome and I feel a bit nostalgic over them even though I was not even alive until 30 or 40 years after many of them were taken. 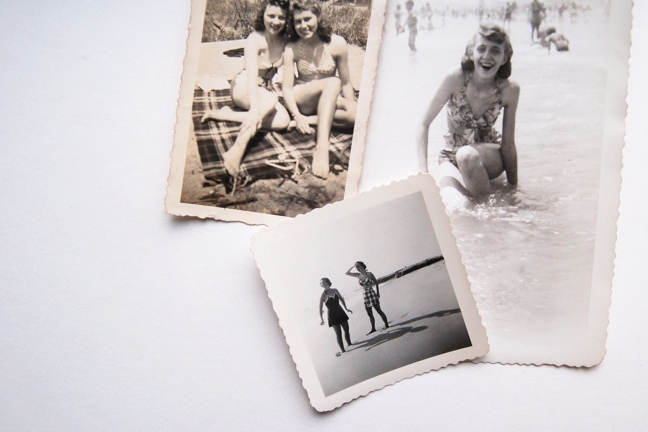 My main focus has been on images of women in the 1940s and 50s- specifically images of women – but also of seasonal scenes of people of any gender or age having fun. The fashion and the elegance of women at that time is unmatched. Their swimsuits, high waisted shorts and shoes are, to me, the pinnacle of vintage awesome. Sometimes I even 1950s pandora station to get into the mood. It’s a good mood. You should try it. Once I have the images in hand, I pick a few to work on at a time and scan, edit and crop them. Usually my edits are pretty simple – color and contrast adjustments and sizing. Very rarely have I edited something out completely though I do sometimes have to get a scratch or imperfection off someone’s face. If I see an image I love that does have something in it I can’t use, I will edit it out but I like to keep them as “original” and genuine as possible. Once the images are nice and crisp and contrast-y, I print them and treat the fabric I’ve created just as I would a fabric I bought off the bolt. The process from there on out is the same as it is for the rest of my work… sketch, stitch, wash, iron, stretch and finish. I never select photos based on the text I want to pair them with. Just like with my printed fabric hoops, I kinda just go with the flow – let the image speak to me sort of thing. Of course there was this : my first hoop featuring a four letter word. Then there was cranky carousel girl… a little less shocking but certainly an expression of discontent and also, sarcasm. 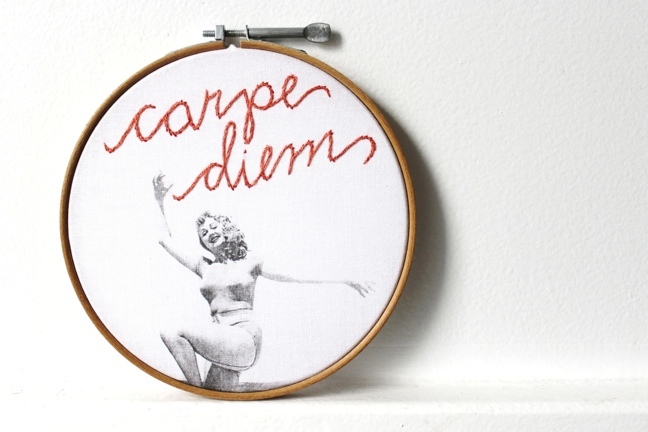 Truly this is a timeless sentiment though the hoop is vintage as is the photo, obviously. Of course I mostly stick with the classic merriweather sentiments. Though I have stretched these vintage snapshot pieces in new, contemporary hoops, I have been collecting vintage embroidery hoops for them as well. 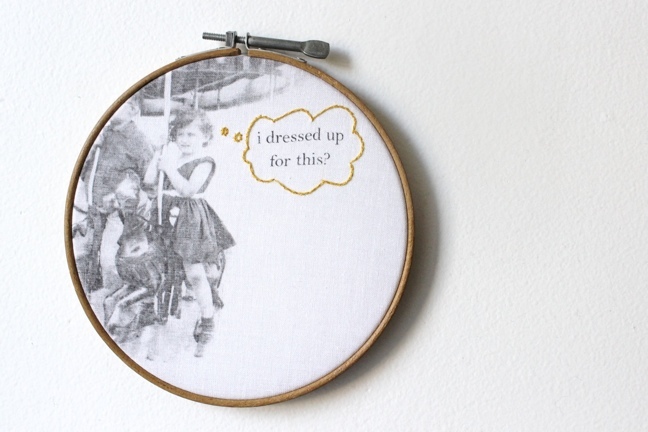 I think pairing the vintage photo with the vintage hoop just really completes the look. 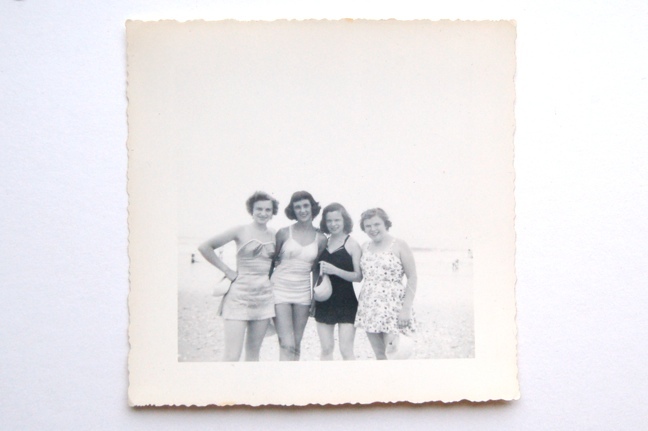 Another fun aspect of this endeavor was when a friend of mine asked me to make a hoop for her grandmother’s birthday featuring an image of her grandmother as a young woman during her first trip to the ocean. 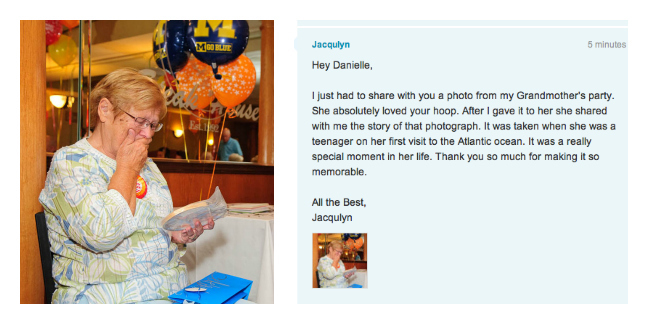 I really loved that because not only was the photo awesome, but so was her grandmother’s reaction to the piece. She shared this photo (credit) with me of the moment. Too cute!! 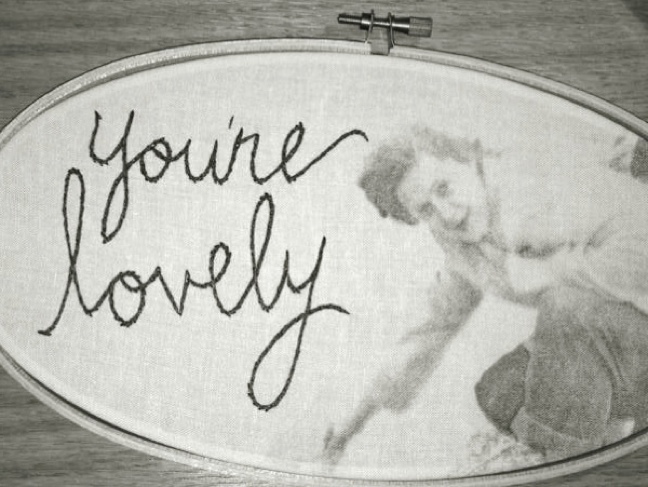 If there are any stitched sentiments you’d like to see or have any images you think could work for this project, please let me know! I would love to hear your thoughts on possible text add-ons for some of these images!